A cruiser bike has a different design than a racing bike or a mountain bike. Owners of cruiser bikes are looking for a completely different riding experience than owners of other bike types. Whilst mountain bikes are built to withstand the ups and downs of riding mountain trails and climbing up steep hills, and racing bikes are built primarily for speed, cruisers are really designed for pleasure riding, whilst also being functional. Depending on the manufacturer, a cruiser may come with a 1-speed, 3-speed or 7-speed gear system. Many single speed models are available, which would have some riders aghast at the very idea of purchasing such a bike. However, most cruisers are used on flat or nearly flat roads, along the beach, and elsewhere. The intention of using a cruiser bike is more for fun activities, not challenging oneself on riding trails with steep inclines. A Best Cruiser Bike will be heavily adjustable to suit the height of the rider. The more upright, longer frame permits this kind of vertical adjustment without a cruiser looking odd for taller riders, which is pleasing. Nothing is sacrificed by choosing a cruiser bike. Depending on the make, model and price paid, quite often brand name parts will be used in putting together a cruiser bike. As such, a cruiser can be everything as durable as a mountain bike, perhaps even more so, because it won’t likely be taking the kind of damage through wear and tear that a well used mountain bike certainly would be. Our Best Cruiser Bike reviews are broken down into bikes suitable for men and bikes suitable for women. There are no unisex bike models here. We determine which cruiser bike is best for the money, best on a budget, and best overall. This is done separately for men’s bikes and women’s bikes, so there are 6 category winners within this lengthy review. This is considered by us the best cruiser bike for men on the market! The sixthreezero Men’s In The Barrel 26-Inch Beach Cruiser Bicycle is the winner in the Best Cruiser Bike for Men category. 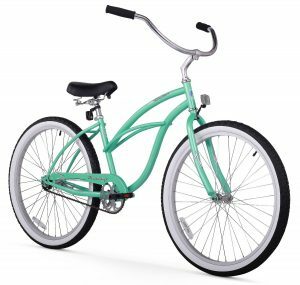 This beach cruiser is an ideal design for anyone who wishes to cruise up and down the beach in style. Ride around happily on this 3-speed bicycle, seated on the black leather saddle with its bubble style. The steel frame uses an elongated, thicker tube cruiser design with a seating level that can be adjusted for men who stand between 5 feet, 4 inches and 6 feet, 4 inches tall. Ride on the beach, along paved roads or regular biking trails. The Shimano 3-speed gear system, coupled with the Nexus shifter, makes moving through the three gears a breeze. The model is available in Neon Blue, Matte Black, Cool Gray, or Mammoth Orange. The In The Barrel model reviewed is the 3-speed version, however, there are also single speed and 7-speed version available. 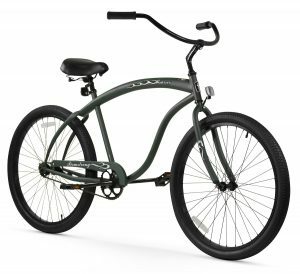 The Firmstrong Bruiser Man Beach Cruiser Bicycle, 26-Inch is our winner in the Best Men’s Cruiser Bike for the Money category. This curved cruiser bike frame model comes in a 1-speed and 3-speed version. The frame itself is several inches longer than a standard cruiser bike frame which provides more space for taller riders. The cruiser upright handlebars are especially easy to reach and hold whilst in a tall, seated position. The thickness of the frame, coupled with the jet black 26-inch Kenda tires, are a standout with this tough-sounding Bruiser Man Beach Cruiser. The 26-inch aluminum wheels provide more rigidity beyond what the elongated bike frame delivers already. The saddle is generously padded, dual spring, and made in a wider version than one might find on a racing bike. Both the 1-speed and 3-speed models come with coaster brakes for access to the braking system via the pedals, rather than the handlebars. The 26-inch model of this Firmstrong Bruiser Man Beach Cruiser Bicycle can fit a male rider 5-foot, 4-inches up to 6-foot, 2-inches in height. The Firmstrong Urban Man Beach Cruiser Bicycle is the winner in our Best Men’s Cruiser Bike on a budget category. This bike comes with a classic curved cruiser frame that is not as elongated as the Men’s category winner. There are no fenders above either tire. The balloon tires are larger than on some other bikes that riders may be used to. However, this provide an incresed level of comfort through improved balance and support. The 26-inch wheel rims are also solid items. The model reviewed has the 26-inch wheel with the 1-speed gear. There is also a 3-speed and a 7-speed gear option with the same 26-inch wheel, and there is also a smaller 24-inch wheel version with a single gear. The saddle with this Firmstrong Urban Man Beach Cruiser Bicycle is a plush, large dual spring one. This is useful for larger male riders. The bike itself fits larger men with its 19-inch frame suiting males from 5 feet, 4 inches to 6 feet, 2 inches tall. A cruiser bike is a lovely one to own when only needing to ride around mainly flat roads, along the beach, and other similar terrain. A cruiser typically had a longer, higher frame where the rider sits taller and in a more comfortable riding position. Built for pleasure riding, these are not mountain bikes or racing bikes. Instead, these types of bikes typically have sturdier frames, wider tires, and excellent durability. With this said, nothing is necessarily sacrificed when choosing a cruiser model over something else like a racing bike. Each type of bike has its pros and cons. One upside for people with back problems is that the cruiser bike design, with its more upright stance, puts more weight on the front of the body. It reduces the weight on the back with this alternative riding position, when compared to other bike types like mountain bikes or racing bikes. For cruiser bikes, most manufacturers generously offer multiple frame sizes, or at least, the choice of gears with a 1-speed, 3-speed and 7-speed gear options often made available. There are frames suitable either for men or women, with good options for both sexes. Quality parts are always something to look out for. A Shimano gear system is the ideal choice with a 3-gear or 7-gear system. An easy to use gear shifter is nice too. Fenders are not always fitted to cruiser bikes. They can be added as an extra later from a bike shop. In many cases, the terrain isn’t muddy and so fenders aren’t always necessary. 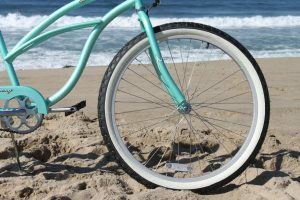 The sixthreezero Men’s In The Barrel 26-Inch Beach Cruiser Bicycle is the winner in the Best Cruiser Bike for Men category. 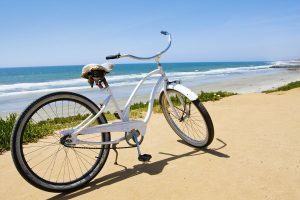 The style of this beach cruiser bike is a good one for riding along the beach with its comfortable, relaxed handlebar position and padded leather seat. For local trips along the road or to the beach and back, a cruiser bike like this one is a pleasure to ride. With the 3-speed model of this In The Barrel model, trips up a distance up to 20 miles at a speed of 3 to 16 MPH would make sense, but faster rides or longer distances would suggest a move up to a 7-speed version. The steel frame delivers robust strength with its extended, thick tubular design. The seating level can easily be adjusted for a man standing 5 feet, 4 inches and 6 feet, 4 inches tall. The saddle itself is a heavily padded, dual spring comfort cruiser model that shouldn’t need replacing for a more comfortable alternative, like commonly happens with cheaper bikes. The seating position is a more upright one, with a handlebar that sits high up with the arms extended out. This is a more relaxed riding position designed for enjoyment over racing speed, which suits the cruiser bikes design ideal. The handlebar grips are made from a pleasant stitched black leather. The tires are wider than most and come in a mesh tread that provides good grip on a variety of surfaces. One of the better Shimano 3-speed gear systems is fitted with this bicycle. Shimano gear systems are second to none and a good addition to any bike. A Nexus shifter is paired with it, which makes shifting through the gears, while riding, a simple affair. The Coaster brake system is robust and will give the rider confidence when braking using the pedals, instead of a typical brake system linked to the handlebar. The gear system can be a little sensitive at times, with the gear system wanting to shift into first gear from second gear on occasion. 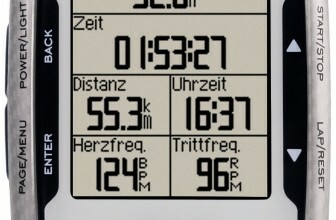 This simply needs a little adjustment to tweak how the bike performs in this respect. This bike model from sixthreezero also comes with a single gear and 7-speed gear versions. 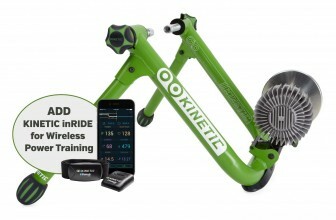 The information provided in this review relates specifically to the 3-speed model, which will be suitable for more riders. Pricing gets cheaper for the single speed model, and more expensive for the 7-speed version. The 3-speed model is available in Neon Blue, Matte Black, Cool Gray, or Mammoth Orange. There are rubber block comfort pedals fitted, which are comfortable to ride on even in flip-flops or sandal beach wear. A kickstand is provided with this model. It needs to be fitted to the bike by the rider. The angle of the kickstand is a little odd, with some riders deciding to bend it slightly to improve the angle so the bike looks less like it will fall down. It is really the only significant negative with this sixthreezero Men’s In The Barrel cruiser. The bike weight is approximately 40 pounds. The attractive curved cruiser 19-inch frame is actually longer than the standard cruiser bicycle. This is helpful for taller riders and people who just like to have more leg room. Also, for taller children who are growing fast, this type of bike may give them room to grow into it if they’re already tall enough to use it properly. Anyone with longer arms will also appreciate the elongated design of this model which puts the wide handlebars a greater distance away than is normal on a cruiser bike. This model is suitable for male riders from 5-foot, 4-inches up to 6-foot, 2-inches in height. Taller riders than this will not be able to comfortably go through the full riding motion successfully and will need a different bike model to better suit their height. We’re reviewing the 26-inch wheel with the one speed gear here. There is also a 3-speed and 7 speed version, plus a 24-inch wheel version also with a single gear feature. The 26-inch aluminum wheels with stainless steel spokes, fitted with 2.125-inch Kenda tires, gives this Bruiser Man bike an Alpha Male robust appearance, whilst providing a strong grip on the road. Whether riding on urban roads and along the beach, this bike will certainly fit the bill. The saddle is a spring version with a wider seating area and a good deal of padding for a comfortable journey. The 1-speed and 3-speed models include KT coaster brakes, which are controlled using the pedals, rather than by using a handlebar brake system. This is easier to maintain and manage, whilst having fewer cables snaking around the bike to possibly get tangled up. The handlebar also has grips made of black synthetic leather. The single speed bike makes it far easier to change a tire without needing to worry about moving the gears first. This bike has a rider weight limit of 270 pounds. The bike weight is approximately 43 pounds. The model reviewed is the 26-inch wheel version with a 1-speed gear. Keeping the same size wheel, there are 3-speed and 7-speed versions available for greater acceleration and speed options. These ones will be better on roads and locations which rise and fall in incline or elevation. A smaller 24-inch wheel bike with a single gear in the same Urban Man Beach Cruiser design is also available. 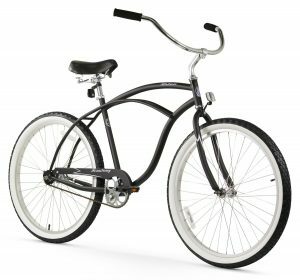 This 19-inch steel framed classic cruiser is shorter than some of the other men’s cruiser bikes that sport longer designs. The classic design extends to the lack of fenders on the front or rear or this model, which will probably suit male riders more anyway. The single speed model comes in a range of 13 different color choices. These include Matte Black, Shiny Brown, Matte Red, Emerald Green, and Chrome Plate. The impressively large 2.125-inch wide Kenda balloon tires, with their attractive white walls and deep tread, help to provide a softer riding experience when fitted on the 26-inch wheel rims. The saddle is the usual dual spring variety. It is pleasingly wide and comfortable for short to medium duration rides. The bike frame and the adjust-ability of the seat ensure that the bike can fit male riders from 5 feet, 4 inches to 6 feet, 2 inches tall. There is a 360 pound weight limit on this model for men. 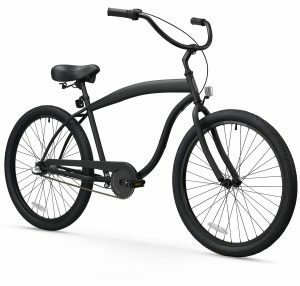 There are reports of 250 pound male riders having no problem using the Firmstrong Urban Man Beach Cruiser Bicycle, if that provides some indication about any difference between specifications and reality for riders. There are no fenders supplied with this bike. It is possible to buy a pair of chrome fenders that would look the part and protect from water splashes and avoid mud spraying up too. The bike assembly comes almost complete in the box. The handlebars and front wheel come disassembled and have to be assembled properly to use the bike. It is advisable to check the tire pressure before taking the bike out for its first ride on the road. The bike weight is approximately 38 pounds. As a budget bike choice for men, the Firmstrong Urban Man Beach Cruiser Bicycle is surprisingly good. A great cruiser bike should start with a solid tubular frame. With cruiser bike models, the frame is usually elongated and taller. This is because the design of most cruiser bikes is more upright than another riding position offered by other bike designs. Quite often, the frame will be made of steel to increase its rigidity. Cruiser bikes come with different amounts of available gears. 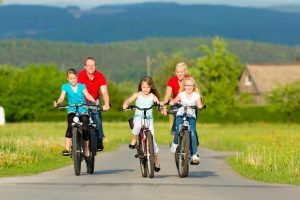 The reason for this is because some riders will only be riding on flat surfaces and have no need to shift through the gears to be able to handle steep inclines either around their neighborhood or on a long ride. These types of bikes are usually for short 1-15 mile round trips, rather than extended 100+ mile bike rides, and the gear choices reflect that reality. A quality gear set, like one from Shimano, is good to see. An easy way to shift through the gears on a 3-speed or 7-speed model without being awkward for the rider, while on the move, is a good addition too. The braking system is usually via the pedals, rather than the traditional handlebar brake control, which may be new to some riders. It works well either way. Height can typically be adjusted for taller and shorter riders. The range of heights supported by most cruiser bike frames is generous, both for men and for women. A different frame size can also be chosen to alter the height that a selected bike support. 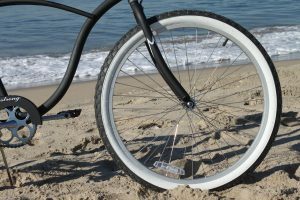 The tires don’t need to always be a reputable big name brand, but a good “grippy” tread and a thicker tire is preferable to a slimmer one on a cruiser bike. This is particularly true with cruiser bikes for men and for anyone who is taller or heavier built. 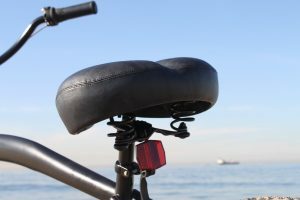 The saddle is one that gets used a fair bit, so look out for a padded saddle that is good enough to use and won’t need to be replaced after the bike is purchased. Bear in mind that of all the post-purchase upgrades, the saddle is almost always the first item to be replaced due to comfort issues. The Firmstrong Urban Lady Beach Cruiser Bicycle is the winner in our Best Cruiser Bike for Women category. The model reviewed has a 17-inch steel frame with the 1-speed gear, which will support a woman between 5 feet and 6 feet tall. There is also a 26-inch wheel version with a 3-speed and 7-speed gear, plus a 24-inch wheel version with either a 1-speed or 3-speed gear. The balloon tires sporting a white wall, matched with strong aluminum wheels, provide a comfortable ride. The fitted seat is an oversized padded one that is a pleasure to use. There are coaster brakes that can be accessed using the pedals rather than the more usual handlebar-located brakes. This bike is ideal for short rides of up to 20 miles round trip. The rider speed can be from 1 MPH to 15 MPH depending on how many gears on the bike are being utilized. 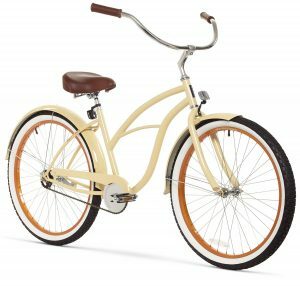 The sixthreezero Women’s 26-Inch Beach Cruiser Bicycle is the winner in our Best for Women’s Cruiser Bike for the money category. This is an extremely colorful bike, whichever color is chosen from the 11 colors available. The accented paintwork, handlebars and seat color all work extremely well together. We focus on the 26-inch wheel, 1-speed gear version here, but there are also 3-speed and 7-speed models available too. This model has a 17-inch steel frame with curved accented elements throughout. The KT Coaster Brake system is used which is activated through the pedals, rather than via the handlebars. This is a reliable braking system. Unlike with some other cruise bike models, this one comes with a front and rear fenders. The alloy rims are color matched to the color of the bike selected. Quality Kenda tires that come with this model have attractive interior coloring to play off the color scheme of the bike too. The Schwinn Destiny 24-Inch Cruiser Bicycle is the winner in our Best Women’s Cruiser Bike on a budget category. 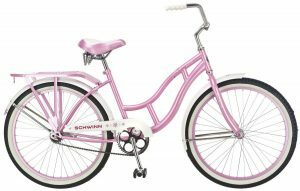 This pink color only, 24-inch cruise bicycle from Schwinn features a Schwinn steel frame and fork, which provides strength and durability. The alloy rims are lightweight, but have a solid built quality to them. There is a full fender system built on the bike and a useful rear cargo rack, which saves needing to purchase one separately. As such, this women’s cruise bike is more than just for pure recreation as it can be used to go shopping around town as well. The saddle is a wider cruiser type and padded for longer rides. This bike will suit women 5 foot and taller. The package comes partially installed. The rear wheel and the fender are installed, however, the front wheel and its fender, the pedals and the handlebars are not installed. It can take upwards of an hour to install them correctly. It may also be possible to purchase the bike and pay a local bike store to assemble it correctly for a fee. 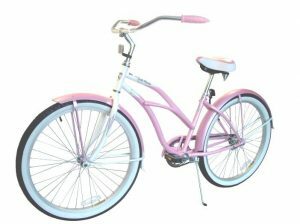 This bike has a 17-inch classic cruiser steel frame that is suitable for women from 5 feet tall up to 6 feet tall. This is a nice range of heights for a lady’s bike. The model reviewed is the 1-speed version, but there is another 26-inch wheel model with a 3-speed or 7-speed gear, plus a smaller 24-inch wheel model with a 1-speed or 3-speed gear. The 3-speed shifting gears are internal and covered, which may be preferred by some riders. This model has a wide range of color choices available. Fifteen color choices in all, including Army Green with Pink Rims, Black with Pink Rims, White with Pink Rims, Baby Blue, and Mint Green. It won’t be difficult to pick a favorite color from the wide selection offered. The oversized knobby cruiser balloon tires with their white inner wall deliver a pleasant riding experience. The 26-inch aluminum wheels have an attractive spoke design too. The seat provided is wide and super padded for ultimate support. 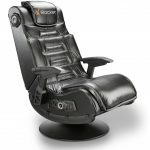 Good value is provided by this seat and it is unlikely to need to be replaced for a larger or more comfortable alternative. The set of coaster brakes supplied operate through the pedals, rather than the handlebars. These types of brakes are less fussy and easier to maintain with fewer cables to worry about. The bike is intended for short trips up to 20 miles at a time. The achievable speed will range from 1 MPH to 15 MPG, depending on the number of gears available with the model selected. Flat terrain is best, as cruiser bikes are not really designed for hills or undulating terrain. The handlebars are wider and come with foam grips to make them easier to hold. The high seating position and wide arm position with the handlebars feels comfortable. Fenders are available, but need to be purchased separately for this model, as this bike comes with no front or rear fenders at all, nor a cargo rack. Firmstrong has a decade long history of delivering reliable bikes to riders nationwide. This model comes pre-assembled for 80 percent of the parts, with 20 percent still needing to be assembled by the buyer. The remaining assembly takes about 40 minutes to complete. A set of hex keys might be useful during the assembly process. It is a good idea to pump some additional air into the tires before setting off on a first ride with this bike. The bike weight is approximately 38 pounds. The sixthreezero Women’s 26-Inch Beach Cruiser Bicycle is the winner in our Best Women’s Cruiser Bike for the money category. The first thing that truly stands out with this Beach Cruise bike is the 11 bike colors. It doesn’t matter which one is chosen, the bike will stand out in a crowd. Each color scheme works well with the existing parts on the bike. 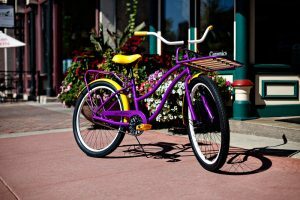 This model has a classic cruiser 17-inch frame, rather than elongated one, and is built with steel for added strength. This 26-inch wheel model comes with a choice of 1-speed, 3-speed and 7-speed gear system. The 1-speed model is fine for getting around flat roads over limited distances, whereas the 3-speed and 7-speed versions of this cruiser bike will be better suited for longer journeys, including any with road inclines. One interesting feature of this bike that is less common is that the gear circumference with the chain is shorter. This causes the rider to need to peddle faster than with other models. For casual riding, this won’t be a problem, but for longer rides or journeys with friends, the owner of this bike will have to put in more effort to keep up with the pack. There are front and rear fenders on this model, which is not so common for cruiser bikes. There is no rear cargo rack fitted, though this could be added later. The KT Coaster brake used here may be new to some riders, as it is a different braking system to the one connected via the handlebars, but it works just as well. The 26-inch alloy wheels are good quality and look the part. The Kenda tires, complete with interior coloring to accentuate the color scheme of the bike overall, is a quality addition that is welcomed at this price point. The set of Kenda tires sport a slick tread. The brown wide bucket saddle is comfortable for long rides. It has some attractive stitching that matches its color. The handlebar grips also come in the same brown color as the saddle, which is a nice touch. The bike will suit women who are between 5 feet, 2 inches and 6 feet, 2 inches tall. 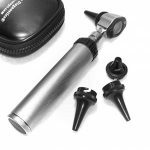 It can be used on journeys up to 20 miles on a round trip. The riding speed will vary from 1 to 15 MPG depending on terrain and the gear model selected. Some assembly will be required once the bike is received. It comes over 80 percent pre-assembled. The bike weight is approximately 38 pounds. This one-speed Schwinn model is a basic one that fits into our budget category nicely. It lacks some of the niceties like a 7-speed gear system, sophisticated gear changes, multi-colored paint jobs, and other items that one might look for. However, in its place, what you get is a worthwhile cruiser bike for the ladies who just want to be able to get around town with a minimum of fuss. The distinct pink color of this model means at least you’ll be able to quickly spot your own bike on the bike racks when coming out of the supermarket or shopping mall. For anyone who wishes to have something a little more sporty, this model may not be for them. 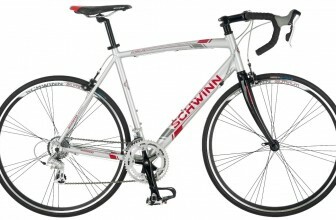 The Schwinn steel frame and steel fork provide a strength that can be relied upon. There is certainly no carbon composite material here to allow the fork to bend to the rider’s own movements, but the ride is still an acceptable one. The cruiser saddle is a wider version with a good amount of padding for longer rides. It is unlikely that the saddle will disappoint, which is impressive because usually budget bikes are almost always let down by the saddle. This bike will suit women 5 feet, up to 5 feet, 4 inches tall, so there is no need to worry about not being tall enough to fit easily on this bike. One of the nicer features that is lacking on most other cruiser bikes is a fender system. These are provided front and back and incorporated into the bike’s design and color scheme. There is also a rear cargo rack, which will certainly come in handy during shopping trips. The alloy rims have an attractive design to them and are sturdy enough. The tires are decent too. This bike doesn’t arrive fully assembled. The rear wheel and rear fender are installed already, but the front wheel, front fender, pedals and handlebar need to be assembled. This can either be done by the buyer or they could always ask a local bike store to assemble the bike for a modest fee. The assembly could easily take at least an hour to complete. Being a smaller bike, it is not as heavy as some other models. However, the addition of the fenders and rear cargo rack add to the weight. It would be a good idea to purchase a separate carry item to facilitate shopping trips, like a shopping basket or something similar, that can be affixed to the rear cargo rack. If wanting to have a local bike store assemble the bike for you, it might be a good idea to purchase this shopping basket at their store to create some goodwill on the price of the bike assembly. Fenders, which protect from water and mud kicking up onto the tires, don’t always come with a cruiser bike. The reason is because most cruisers get used on paved sidewalks, local roads and perhaps along the beach. None of these areas typically see a lot of flying mud gumming up the tires, reducing the effectiveness of the braking system. With most models of cruiser bikes, it is possible to purchase fenders separately. A flip stand is a nice extra. Not all models of cruiser bike come with them. It is possible to purchase a third party kickstand that will work with a cruiser bike though. Whilst a cruiser bike is not typically modded out with the latest bike gear top to bottom, it can still be beneficial to add some little extras. These might include some front and rear lights, a drinks holder, and some protective head gear. A good locking system is also an excellent idea. A cruiser bike is pretty valuable and so it is smart to protect it. Don’t go cheap on the lock either as basic locks are easy to defeat. The purchase of a cruiser bike for a man or a woman is a decision not to be taken lightly. The bike is designed mainly for flat road or beach use and used on fairly short journeys. Other than with a couple of the bikes for the ladies, cruiser bikes usually lack both front and rear fenders, and a way to easily store recent purchases on a trip. It is fair to say that when a rider will want to take these types of bikes out for longer rides with undulating terrain and through muddy fields, a cruiser bike may not be the correct choice. However, for riders who know their local area is pretty flat and easy to ride on, a cruiser is an ideal choice. Anyone with a bad back will appreciate the design of the cruise bike frame too, which puts less pressure on this part of the body. In terms of gears, these come down to whether you plan to need to ride faster by moving through the gears, rather than by simply peddling faster. Anyone living in an area with some roads on an incline will benefit from selecting at least a 3-speed bike over the 1-speed option and will likely be glad that they paid a little extra to do so. The men’s and women’s best cruise bikes were selected based on features and overall value for money. The cheaper bikes in their respective categories are still good bikes, but just don’t deliver as much for the price in quality components, durable materials, and ease of use.